What would you do if your dog started making strange wheezing sounds -- somewhere between a reverse sneeze and a coughing/choking sound? That's what happened to Cosmo this morning, resulting in an emergency trip to the vet, x-rays and a full exam to try to locate any obstructions. 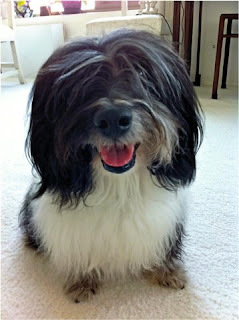 This story has a happy ending and Cosmo is just fine now, but here's how it all went down. 8:10 a.m. -- Cosmo heads to the backyard, does his usual sniffing around, searches for squirrels, eventually goes potty and heads back up to the kitchen for breakfast. 8:30 a.m. -- Once inside, Cosmo starts snorting and sneezing. He seems to be breathing o.k., but he's clearly distressed and uncomfortable. After checking his mouth and looking and feeling for any obstructions I decide to head to the vet. 8:50 a.m. -- Magically, once we entered the vet's doors Cosmo's wheezing calmed down, of course. But he still didn't seem like himself and he snorted a few times. 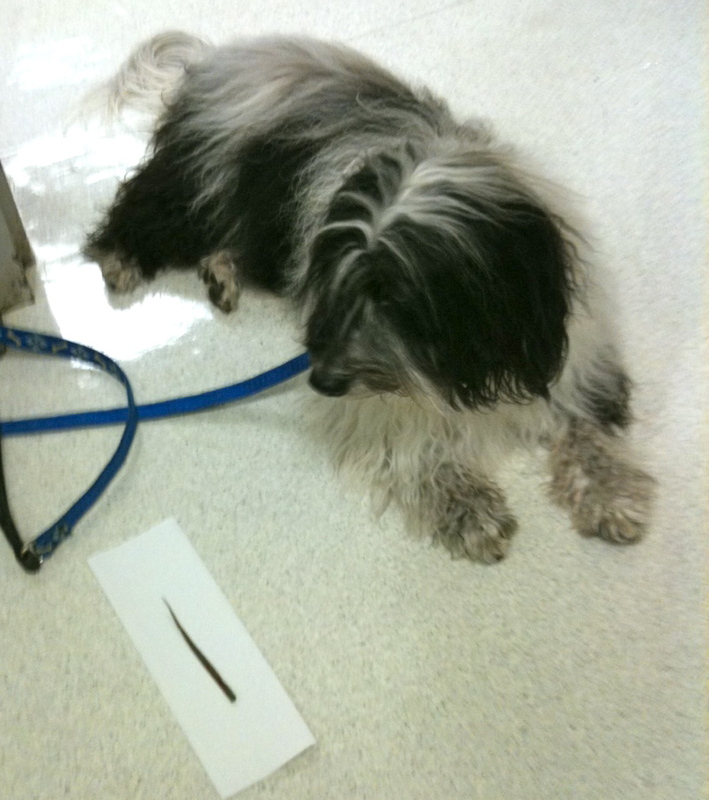 Vet conducts full exam and x-rays and finds no obstructions. She sends us home with an antihistamine to try to calm his wheezing. That's right, it was a pretty impressive blade of grass. Even Cosmo's vet wanted a photo of it! Cosmo peruses what just came out of his nose. Ewwww! Returning to the scene of the crime, these tall blades are much like the one's Cosmo inhaled. Some of the activity that likely led to the incident. While eating grass isn't typically a dangerous activity, and Cosmo likely would have recovered without a trip to the vet (it seems the Hills treat was all we needed! ), I wanted to play it safe since I didn't know what was causing the problem. Most likely Cosmo inhaled the grass through his mouth and in the perfect storm of events, it got lodged in his nose, somehow. (Think about what happened when you were a kid drinking milk and someone told a funny joke.) Anyone else have a grass snorting experience? I am glad you are ok Cosmo! oh dear Cosmo! Sounds scary! Why do we like grass so much? I sometimes eat it to soothe my tummy, but it's not good for me (pancreatis)! So glad you go to the bottom of it! Glad you are OK Cosmo! Thank dog you're ok! whew.... That grass is huge! Glad you are okay...it must have been a good feeling to get that out of your nose! OMD! That's a freak occurrence, but I'm glad you're OK, Cosmo! Must've given your mom quite a scare. :-( Thanks for the tips. yikes Cosmo! So glad you're ok! Lots of great advice too! It was very freakish! I'm glad I didn't get any grass up my nosey THIS morning! I am MUCH happier today! Thanks for all the nice thoughts... and stay away from grass... Just say NO! BOL! Cosmo & His Mom, Thanx for sharing this information. ChazzTheDog wheezes from time to time & I didn't know what to make of it. I will be on the lookout & I will get antihistamine just for small emergency. Any particular kind "for dogs" or hooman is okay. 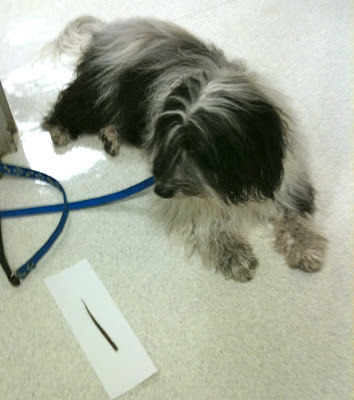 @Adoptedmom - Be sure to ask your vet for the correct dosage of antihistamine. Cosmo had actually taken over-the-counter human types before for his allergies but you do want to make sure you don't give them too much! Thank you for providing this totally realistic story containing symptoms and diagnoses. I have HAD IT with the the internet pet-related horror stories. We have pulled out our 3rd blade of grass.. and yes they were LONG. Wow.. and yuk! I am not convinced we have them all. He is still wheezing and on Benadryl. We now has a good amount on snot in one side of his nose.. did your dog experience the whole snot thing? I am think his was in there long enough to irritate him as it was days before we figured it out as one peeked out and my husband saw it. Surely 3 is all, right? Anyway... thanks for the post. This was a first for us too. Oh my goodness! My 6 month old Shitzu just shot a blade of grass out of his nose. He's been coughing and hacking for 3 days. My husband witnessed the grass eating! Wow that was scary! wonderfully helpful article on dog wheezing, thanks.